Transport Models - 1958 Dodge/Sun/Pyrene Foam Tender. 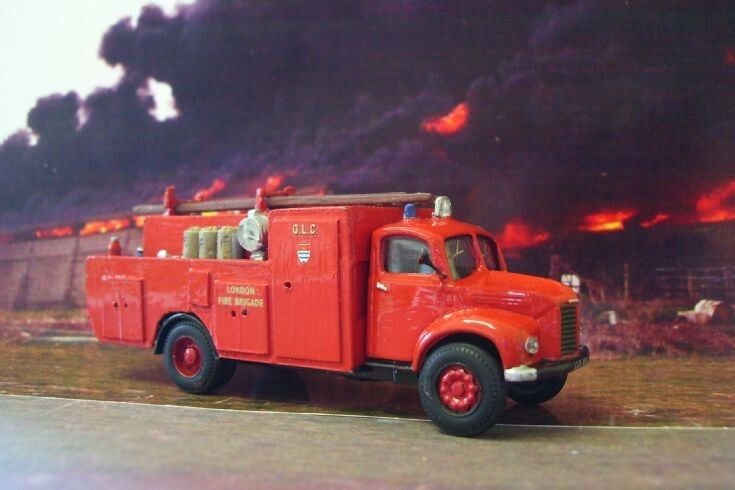 This picture shows a conversion of a Base Toys Dodge (drop-side) lorry in 1/76th scale to the 1958 Dodge/Sun/Pyrene foam tender used by the London Fire Brigade. The original vehicle was part of the Essex County Fire Brigade and was based at Dagenham until 1965,it was then incorperated into the enlarged LFB.It was then stationed at Barking until 1971,then East Ham until 1973 when it finally went out of service. Nice one Pete,i knew you would get the cab to fit. Added by Bristol Bob on 12 April 2010. That looks good Pete!! Nice job mate. Added by Stevie Murray on 12 April 2010. Hi Bob, thanks for the tip on the Base Toys Dodge D/S Lorry. I couldn't just change the cab (its bigger) so decided to model another FOT, but got it right this time. Other picture shows both models. Added by Pete Matten on 12 April 2010.